MEXICO CITY (CNS) — A former Mexican soccer star, now mayor of the city of Cuernavaca, staged a hunger strike in atrium of the city’s centuries-old cathedral to stave off attempts at ousting him from office. 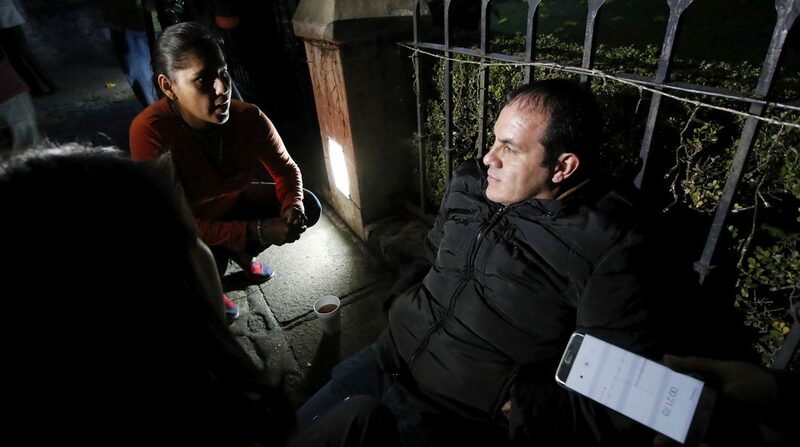 Cuauhtemoc Blanco started the hunger strike Dec. 17, two days after the Morelos state legislature impeached him, alleging he did not meet the residency requirements to serve as mayor. A member of Mexico’s Supreme Court issued an injunction Dec. 18, prompting Blanco to end his hunger strike, though not after winning national and international attention. Blanco stayed in the cathedral atrium with the permission of Bishop Ramon Castro Castro of Cuernavaca, who, like the mayor, has found himself at odds with Morelos Gov. Graco Ramirez, a self-described member of the “progressive left,” whom members of social movements accuse of stifling dissent. Ramirez has previously expressed public enmity for Bishop Castro, who has courted government criticism for organizing an annual peace march in Morelos, an often-insecure state with territory disputed by drug cartels and organized crime just to the south of Mexico. The bishop did not comment on Blanco’s hunger strike but prayed for peace in Morelos during Mass Dec. 18, according to media reports. Bishop Castro told Catholic News Service in May after a march for the peace in Cuernavaca that state security officials stopped buses bringing in participants and that prosecutors had opened a case against him over the theft of religious artworks. He also alleged the government had failed to intervene in the case of a parish in the town of Tepalcingo, which had been looted and taken over by thugs who “stepped on and profaned” hosts and threatened to lynch the priest. Others in civil society, including Catholic poet Javier Sicilia, who founded the victims’ advocacy organization “Movement for Peace with Justice and Dignity” in 2011 after his son was kidnapped and murdered, have come under criticism for exposing insecurity in Morelos. The hunger strike also revived uncomfortable reminders about Blanco’s foray into politics after a successful career as a striker with Mexico City’s fabled Club America, where his on-field flare, bad-boy personality and rags-to-riches story won legions of fans — and detractors. Blanco, 43, won election in June 2015, running for a small political party, which analysts describe as a family business partaking in generous public subsidies. His interest in the position also appeared scant: He unsuccessfully tried to create a position in which an underling would have wielded authority, while Blanco served as a sort of figurehead. Blanco has since fallen out with his party. His clash with Ramirez came over policing in Morelos, where the state government wanted to put all police under a single command as a means of preventing organized crime infiltration, a factor in the January murder of Gisela Mota, mayor of a Cuernavaca suburb, two days after she assumed office. Blanco said the single-command concept was not working in Cuernavaca, where he became mayor at the same time as Mota.